BOXING LEDGER | LATEST BOXING BLOGS | BOXING ARTICLES | BOXING BLOG FIGHT: 9-18-09 ESPN's "Friday Night Fights"
9-18-09 ESPN's "Friday Night Fights"
Guillermo Rigondeaux (3-0, 3 KO's) stopped Giovanni Andrade (60-12, 49 KO's) in the 3rd round to maintain his undefeated professional record. In the third round, Rigondeaux fired and landed a sharp, straight left to Andrade's body. Andrade could not continue. Rigondeaux also dropped Andrade in the second round. Protect yourself with sparring equipment. There are many questions that linger about Rigondeaux. Rigondeaux has a stellar amateur background with a record of 243-4, but has yet to be tested as a professional. How will Rigondeaux respond when he's not dictating the pace of a fight? Right now, he is able to take his time and land his punches at will. Sometimes, Rigondeaux waits to engage and looks to counter punch opponents too much. He has the ability to take a huge step up in class against future opponents because of his ring experience as an amateur. The last time Rigondeaux suffered a defeat in the ring was in 2003. Perhaps the greatest amateur bantamweight of all time, Rigondeaux is now trained professionally by Freddie Roach. Roach trains many fighters, but is most known for his work with Manny Pacquiao. There is no professional boxing in Cuba. Rigondeaux fled for the United States to begin a professional career leaving behind his wife and son. "El Chacal" was not allowed to box anymore when it was rumored he defected after he failed to appear at the weigh-in for the July 2007 Pan-Am games. Rigondeaux returned to camp the next day and stated that he was at a bar all night, but was kicked off the national team. As a result, Rigondeaux never had a chance to try and capture a third Gold medal after winning one in the 2000 and 2004 Olympic games. Middleweight Yudel Jhonson (3-0, 1 KO) won an 8 round unanimous decision over Frankie Santos (17-8-4, 8 KO's). Jhonson was a 2004 Olympic silver medalist in the Light Welterweight (139 lbs.) division at the 2004 Athens Olympic games. A southpaw, Jhonson beat Santos to the punch throughout the fight. Santos was tough, but got hit with a lot of clean punches because Jhonson was landing his counter punches effectively. Santos tried diligently to get inside and land body punches. Jhonson kept Santos at a distance and from being set to punch by giving him a lot of different angles. Santos had a lot of trouble getting his punches off. In the third round, Jhonson connected with a solid right hook and followed it with a series of straight lefts that backed Santos up. In the fourth round, Santos got hit by a right to the body from Jhonson. Jhonson then nailed Santos with a straight left to the head. Jhonson fought at a slow, comfortable pace. It will be interesting to see how he reacts when he is tested by an opponent that puts on a lot of pressure and makes him fight at a faster pace. Everlast and Ringside punching bags and save with $2.95 shipping! In welterweight action, Felix Diaz (2-0, 2 KO's) stopped Omar Brown (1-3, 0 KO's) in the 1st round. The 25 year old southpaw stunned Brown with a straight left. Another straight left dropped Brown in the corner against the ropes. Brown got up and tried to hold on, but Diaz swarmed him with punches. Brown went down again. Diaz connected with a right hook - left uppercut combination to drop Brown for a third and final time forcing the referee to stop the fight. 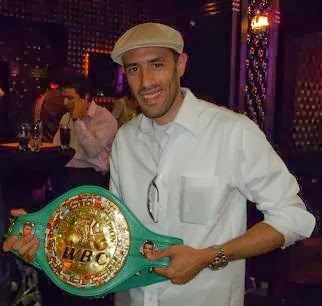 Diaz won the Olympic gold medal in the Light Welterweight division at the 2008 Beijing Olympic games. In 2003, Diaz also won the Bronze medal at the Pan American Games in the Lightweight division. In a light heavyweight bout, Yordanis Despaigne (3-0, 2 KO's) TKO'd Mickey Scarborough (4-1, 4 KO's) in the 1st round. Despaigne landed a stinging right hand and Scarborough covered up in the corner. Despaigne unloaded a barrage of punches prompting the referee to stop the fight. 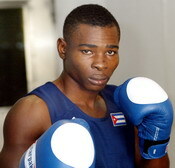 Yordanis Despaigne defected from Cuba in the spring of 2009, along with fellow Cubans Guillermo Rigondeaux and Yudel Johnson, to turn professional.